Abstract:The article discusses pair models of agents’ behavior in a conflict. Each agent has one of three possible behavioral types: deviating, compromise and coercing. A behavioral type determines an agent’s nature and specifies agent’s reaction that should be expected in response to specific actions. The authors select the need to share limited resources as the main cause of a conflict in simulation. The agents need resources to implement assigned tasks and to exist themselves. It is determined that in a conflict situation each agent tries to obtain more resources, than its opponent at the moment. The value of this commitment depends on an agent’s behavioral type. The article identifies the technique of selecting the best behavioral model. It also proposes the measures to resolve conflict between agents. The authors applied the basic concepts of fuzzy logic in simulation. The authors have already discussed the problem of interaction between agents in a multi-agent system (MAS) in [1–3]. They have also considered the models of agents’ goal-seeking behavior and analyzed the impact of these models on system stability. The value of agents’ winning depends on the behavior model which is chosen by an agent. Special attention is paid to the interaction model of agents in conflict. The conflict between agents is interpreted as a contest in which agents seek to achieve mutually exclusive statuses; each of them wants something that only one of them can receive . The main causes of conflicts are: limited shared resources that agents have to share among themselves; the differences of agents’ interests, goals and beliefs, behavioral patterns caused by behavioral types ; differences in the number and complexity of tasks assigned to agents. At the same time each agent owns a certain behavioral type r, rÎR, that reflects agent’s preferences. A behavioral type is a value of an agent’s state when performing a specific task; R is a set of possible preferences of an agent. In  the authors introduced the following semantic rules: the agent is deviating if rÎ(0, 0,5); the agent is called compromise (collaborating) if rÎ[0,5, 0,8] and the agent is coercive if rÎ(0,8, 1). According to the results of the study, compromise agents are ready to make concessions when sharing resources and tend to avoid conflict situations. Coercing agents usually seek to capture as many resources from other agents as possible. Deviating agents are characterized by the fact that the agent relies only on himself and prefers avoiding any interactions with other agents. Nevertheless, conflicts are inevitable when a problem is solved by two or more agents. Typically, the initiators of a conflict are coercing agents, but in some cases the agents of other behavioral types can also trigger a conflict. A conflict situation can arise even when there is only one agent when he starts having some doubts about the correctness of actions and behavior in different operation conditions. Then the subject of research is an intrapersonal conflict . Utopia is the idea of the possibility of achieving an absolutely peaceful state in MAS, when agents interact in harmony with each other and with themselves. As a rule, the efforts for total elimination of conflicts do not lead to a positive result. It should be noted, that in addition to a destructive function conflicts can have a positive impact: different points of view are identified, we may receive additional information, etc. . So the focus should be on the control and management of conflicts in MAS. - environment may affect the change of agent’s resource potential regardless its behavioral type. For example, some agents may share their resources with this agent, while others, on the contrary, take aggressive actions. A agents’ behaviorial model in conflict situations is a dynamic model with a discrete time t, , where T is a completion moment of resource distribution. - , are random components that are associated with environmental influence on agents’ activities, . The closer their values to (–1), the more hostile the environment. Positive values indicate the benevolence of the environment. A zero value indicates a neutral environment. where , are constants which depend on a type of an agent. It is determined empirically that agents prone to evasion and competition (aggression) spend more energy than compromise agents since the latter receive additional energy from positive emotions that arise from resolving a conflict through compromise . Such agent will always receive at least a part of a planned winning, but it’s better than nothing. where , are constants calculated as an average agent type (or average condition), i.e. .
- which interaction model is the most optimal for given initial conditions, i.e. allows allocating the resource fully in a reasonable time? - analysis of the results of the experiments and general conclusions. Modeling is possible in any software environment that supports drawing up charts and graphs and allows performing mathematical calculations. The authors have chosen MS Excel 2013 for its simplicity and clarity. According to the abovementioned algorithm, we have determined the following values of the coefficients k1(ri), k1(rj), k2(ri), k2(rj), k3(ri), k3(rj) for the listed psycho-behavioral types of agents. - the influence of external factors is absent, i.e. no one helps agents, but no one interferes with them. In addition, we consider a situation when the resource is not replenished. It is believed that a given quantity of a resource should be enough for the task. As a rule, the conflict intensifies in terms of nonrenewable resources. Therefore, one of the measures allowing minimizing a conflict between agents is the replenishment of resources. However, from the economic point of view, such event is not always possible. Stages 3, 4 and 6 of the algorithm involve the formation of calculated tables and graphs with cumulative results (fig. 1 and fig. 2). The highest point on each chart indicates the full allocation of resources with creation of a specific deficit in virtue of the conflict. So at the end of the distribution we may take the previous step. In figure 1a) illustrates the interaction of deviating agents, in figure 1b) illustrates the interaction of agents of a compromise type and in figure 1c) illustrates the behavior when dividing the resource between coercing type agents. 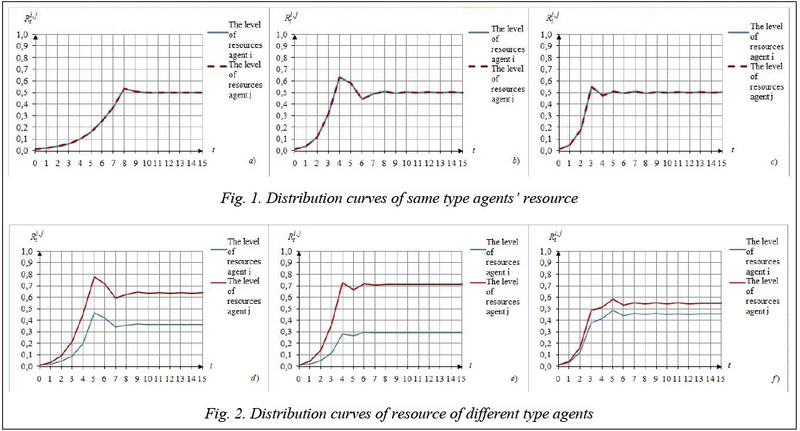 As it can be seen from figure 1, the behavior of compromise type agents is the most similar to the resource allocation condition. At the fourth iteration, they still have 37 % unallocated resource. When maintaining a conflict at the fifth iteration they have a resource shortage of 26 %. Therefore, even agents of a compromise type are not able to act effectively in the context of a conflict. 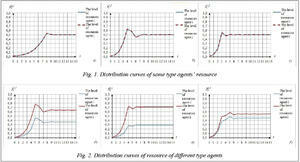 Figure 2d) shows the behavior of deviating agents (agent i resource level) and compromise agents (agent j resource level) types. Figure 2e) shows the interaction of deviating agents (agent i resource level) and coercive agents (agent j resource level). Figure 2f) shows the interaction of compromise agents (agent i resource level) and coercive agents (agent j resource level). From the presented behavior models in figure 2 the best model is 2f). Table 2 provides the information about which step ends the allocation of resources between agents resulting from the condition (6). Table 2 shows that resource allocation time, that most closely matches the specified condition T=5, is equal to four iterations. It is typical for models of the interaction “Deviating « Compromise” (2d)) and “Compromise « Coercing” (2f)). Thus, we confirm a hypothesis about a constructive side of a conflict: negotiation between agents of different types, one of which is compromise, extend the field of agents’ activity; give them the opportunity to negotiate and to come closer to fulfilling these conditions. All other models of interaction are recognized as ineffective. In models 1b), 2e) and 1c) the distribution of resource occurs too quickly and the agents “don’t realize” the essence of the task because of confrontation. In the model 1a) the resource is distributed too slowly, so performing tasks by such agents is delayed. Table 3 shows how much resource is left unallocated at the moment T.
The best distribution score is obtained in the model 2f), since it has only 7 % of unallocated resource on the fifth iteration of the distribution. The remaining values show that agents need to change their strategy of behavior, otherwise they will experience a significant resource shortage that will not allow them to complete the task in the allotted time. Although the model 2f) is the most effective among all presented models, it is also not perfect. - selecting agents that can effectively express themselves working in pairs despite the possibility of conflict between them. For example, under the same conditions assisting the i-th agent only in the first iteration as (fig. 3а) allows a full distribution of the resource (100 %), but for 8 iterations. Now 3d) model is the best, when the assistance is provided for a deviating agent. The assistance for a compromise-type agent in model 3f) causes negative emotions from a coercing-type agent, which only worsens a conflict. where is an assessment of agents’ “fatigue” from conflict; is evaluation of agents’ reaction to the actions of each other. The period of operation of the following inequality (8) shows the active phase of the conflict. In figure 4 shows the active phases of the conflict between agents in all considered models. The graphs in figure 4 correspond to agents’ behavior during sharing of resources presented in figure 1 and figure 2. It is obvious that coercing agents experience the greatest “fatigue” (fig. 4c), and deviating agents experience the lowest “fatigue” (fig. 4a). Other behavioral models are characterized by negotiation, so the peak of “fatigue” is about on the same level. Figure 3 presents the models with little changes in the graphs of this dependence (fig. 5). Now we can see the least “fatigue” in models a) and d). Based on the simulation results above, when assisting the deviating agent in the amount of 1 % on the first iteration, the model d) is recognized as the best. Since this study considers an agent as an intelligent anthropomorphic entity characterized by mental prop- erties, the description of pair models of agents’ behavior in conflict is based on the hypothesis of the implementation of agents behavior proposed by American scientists K. Thomas and R. Kilmann [9, 10]. They identified five main styles of behavior in a conflict situation: adaptation (pliability), deviation, competition (rivalry), cooperation and compromise. Thus, classification features are: the degree of implementation of agent’s own interests and achieving their goals; the degree in which they consider the interests of the opponent. Deviation and pliability strategies are peculiar to deviating agents. Compromise agents can follow the adaptation strategy, as well as and the compromise strategy. Coercing agents typically choose the strategy of confrontation. The simulation results show that both agents can win with only one strategy. It is cooperation. Acknowledgements. The research was supported by the RFBR, project no. 15-01-05545-а. 1. Mutovkina N.Yu., Kuznetsov V.N., Klyushin A.Yu. The influence of goal-seeking behavior of agents on multi-agent system stability. Sistemy upravleniya i informatsionnye tekhnologii [Systems of Control and Information Technologies]. 2014, no. 2 (56), pp. 43–48 (in Russ.). 2. Mutovkina N.Yu., Klyushin A.Yu., Kuznetsov V.N. Me- thods of harmonized management of conflict in a multi-agent system. Sistemy upravleniya i informatsionnye tekhnologii [Systems of Control and Information Technologies]. 2014, no. 3.2 (57), pp. 255–261 (in Russ.). 3. Klyushin A.Yu., Kuznetsov V.N., Mutovkina N.Yu. The fuzzy models of the behavior of individuals and groups making decisions. Tver, TvSTU Publ., 2015, part 2, 248 p. (in Russ.). 4. Fisher R., Ury W. Getting to Yes: Negotiating agreement without giving in. Penguin Group Publ., UK, 1981, 200 p.
5. Mutovkina N.Yu., Klyushin A.Yu., Kuznetsov V.N. Semantic definition of the agent type in a multi-agent system. The problem of interaction between agents. Open Semantic Technologies for Intelligent Systems (OSTIS-2013). Proc. 3rd Int. Sc. Conf. (Golenkov V.V., ed.). Minsk, BGUIR Publ., 2013, pp. 309–316 (in Russ.). 6. Antsupov A. Konfliktologiya [Conflictology]. SPb, Piter, 2013, 304 p. (in Russ.). 7. Desyatov D.B. The conflict theory. Voronezh, Sc. Book Publ., 2008, 346 p. (in Russ.). 8. Ponomarev Yu.P. Game models. Mathematical methods. Psychological analysis. Moscow, Nauka, 1991, 160 p. (in Russ.). 9. Kilmann R.H., Thomas K.W. Interpersonal conflict-handling behavior as reflections of Jungian personality dimensions. Psychological Reports. 1975, vol. 37, no. 3, pp. 971–980. Available at: www.kilmanndiagnostics.com (accessed August 9, 2015). 10. Kilmann R.H., Thomas K.W. Developing a forced-choice measure of conflict-handling behavior: The “mode” instrument. Educational and Psychological Measurement. 1977, vol. 37, no. 2, pp. 309–325. Available at: www.kilmanndiagnostics.com (accessed August 9, 2015).